Well, on primetime Monday night football last week the Washington Redskins were literally man-handled by the Pittsburgh Steelers. As a matter of fact, I thought I was in Pittsburgh for a spell since the fan base was about 50/50 and every Steelers fan had a ‘Terrible Towel’, which made the stadium look like a sea of waving black and gold. That said, the Redskins are 6-3 and likely to beat up on the Cowboys this Sunday night, right? While the game lacked excitement, the Benevino Vineyards Traminette 2007 did not. 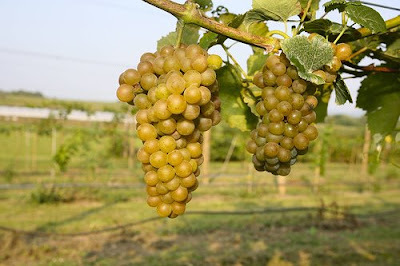 I have talked about Traminette in the past, describing it as “a variety whose name rolls off the tongue just as easy as the wine it produces.” The Traminette grape variety was released in 1996 and is a cross between Joannes Seyve 23-416, which is closely related to Seyval Blanc, and the Gewürztraminer grape variety. While it shares similar characteristics with Gewurztraminer, I do believe the latter has the best potential for making wines of greater complexity and finesse – specifically the Alsatian examples. Most of you Virginia wine lovers have likely tasted Traminette in blends, where it is used to add aromatics and complexity. There are still not a lot of varietal Traminette wines to be found here locally, but that appears to be changing as the popularity of the grape variety grows. The Benevino Vineyards Traminette 2007 is an off dry (slightly sweet) wine with an inviting floral nose, almost like a bouquet of fresh cut roses. On the palate reside flavors of stone fruit, hints of cooking spice, and tropical undertones. This easy drinking and refreshing wine sips well on its own or would pair well with spicy ethnic foods, especially Asian or Thai. This wine is carried by Corcoran Vineyards for $16 per bottle. Benevino Vineyards has been a grower in the state of Virginia for over 10 years, and their fruit has produced a number of award winning wines which you have probably enjoyed. Benevino Vineyards is now producing estate wines from their fruit, and Virginia wine lovers should look for more wines from them in the future. Drop by Corcoran Vineyards in the charm-filled village of Waterford in Loudoun County and seek out this wine, as well as Corcoran’s full spectrum of red and white selections. To find out more about Benevino Vineyards click here. Stay tuned friends ... Corcoran Vineyards, Q&A with Grayhaven Winery, and more!!! Dezel's Virginia Vine Spot © 2006-2008. All rights reserved.